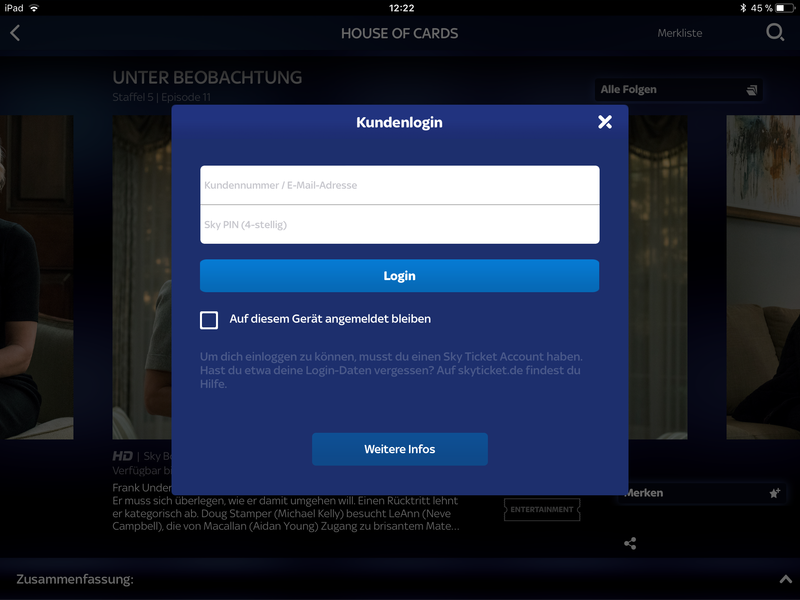 The German TV and streaming provider Sky recently started a new service called Sky Ticket. 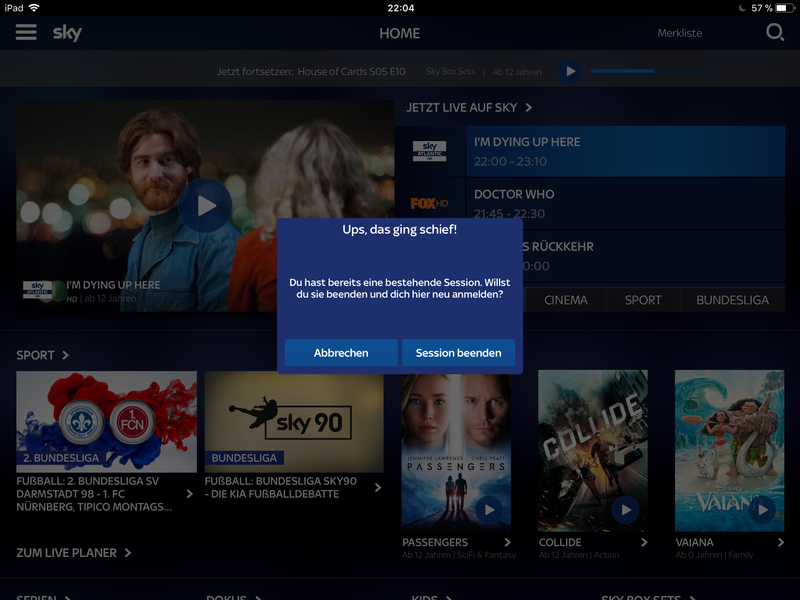 Sky Ticket allows you to stream TV-series similar to Netflix. They offer a very cheap trial for 1 Euro for the first month which means that they have one month to win over people to their platform. Most users are probably used to the good User Experience that the Netlflix app offers and will feel greatly let down by the experience that the Sky app (i am talking about the iOS version here) offers. Much has been written about the bad usability already but I thought I would go a slightly different way and propose three easy wins (there definitely are more) that would make using the app much more enjoyable. The first thing that a user needs to do of course is to log in. Sky requires you to register with an email address and a 4-digit pin (which is a whole other topic on it own…). This pin is probably supposed to make it easier for you to log in especially on devices that do not have a dedicated keyboard such as TVs. The checkbox labeled Auf diesem Gerät angemeldet bleiben (stay logged in on this device) seems to have no effect at all unfortunately. The obvious improvement here is fixing this behaviour and remembering the login credentials. The light-version of this would be to just remember the e-mail-address since even though the PIN is only 4 digits the e-mail is on average 23 characters which becomes very bothersome to type over and over again. Not saving it also adds no additional safety benefits as the device itself is probably not shared and if so only available to trusted users (and you still need the additional pin). One of the recently added features to the app is the option to continue playback where it last stopped. This is a feature that is quite sensible as most people will probably be watching series with it. The way that this feature was implemented just turns out to be an annoyance though. 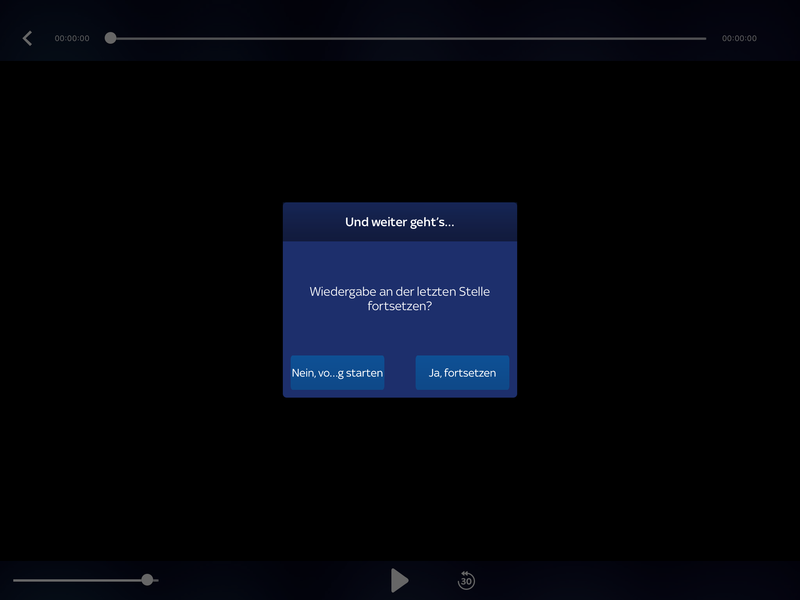 Whenever the user opens an episode that they have already started watching they are greeted with a screen that asks them if they want to continue playback or start again (which is not even completely readable). The better solution here would be to just always continue playback (which some monitoring would probably confirm is what most people want to do anyways). This way - in the case where users want to continue playback - no user input is required. If the playback continues even though people want to start from the beginning, it only requires them to move the scrubber back to the beginning of the timeline which is only one interaction as well. Du bist auf einem anderen Gerät angemeldet. Wenn du hier eine Serie gucken möchtest, musst du dich auf dem anderen Gerät abmelden. You are logged in on another device. If you want to watch on this device you need to log out on the other one. All in all there are a lot of places where the app can be improved. I think this is a great example for where user testing or monitoring (e.g. 95% of all users always choose accept here, let’s just remove the popup and move this into an option) could really help win over users which is one of the biggest task for an app that heavily relies on converting users over from a cheap trial to a more expensive monthly subscription.